When we moved into our house in Exmouth I remember Paul installing decking in the back garden – decking steps from the backdoor, decking over the crazy-paved patio, and more decking steps down to the lawn. A fun project for Paul. For a while it seemed as though we had the whole of the local timber yard in our garden. These memories came back to me as we approached the Passadiços do Paiva, our next destination. 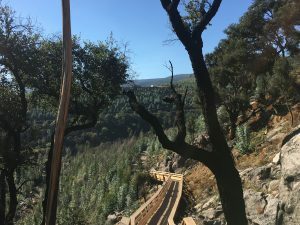 This walk up the gorge of the Rio Paiva takes place mostly on timber steps and walkways that cling to the sides of the gorge allowing people to walk the length of the gorge from Areinho to Espiunca. 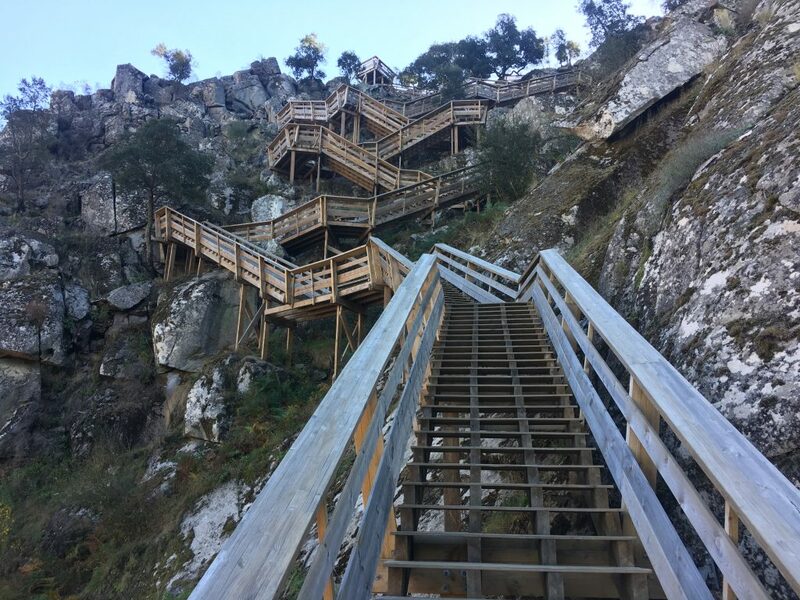 The walkways are in Arouca geopark, an area of Portugal that is designated a Geopark by UNESCO who use this designation to promote the management and development of sites of geological interest. We started by visiting Arouca itself, a pleasant town inland from Porto with motorhome parking and services in the main carpark. We had a walk around the town; it was Sunday and everywhere was busy with visitors, there was a small farmers market in the park but the main attraction was the monastery (I suppose we would call it a convent as it was home to nuns rather than monks, but I think the term Mosteiro is used interchangeably) with it’s sacred art museum. We popped into the tourist office and spoke to a lovely lady who gave us lots of information about walking in the area and warned us off a couple of the paths where signposting had been damaged by forest fires. She sold us tickets for the walkways (you can also buy them online or at the start of the walk) – at €1 each it seemed to be good value. We had intended to stay the night in Arouca but she suggested we could drive up to the parking for the Paiva walkways and stay there if we wanted to. 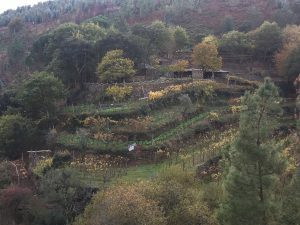 She advised that with an autocaravana we should park at the Areinho end where there was a large unpaved parking area where it looked like someone had sheered off the top of a hill. There is also some parking down the track that leads to the official start of the walk but it was a narrow road and we couldn’t see how much parking there was so gave it a miss – when we walked down the next day we realised that we could have parked there easily but the track down had no passing places so not an option for a busy day. Off we toddled, mild sat nav frustration this time as the sat nav didn’t want to allow us to leave Arouca by the main route, there is a 3.5 tonne limit on some roads which was the cause of confusion to the poor thing. We ignored it’s instructions for long enough to get out of town and then found our way easily to the car park where a couple of campervans were already in situ. We watched people returning to their cars at the end of the day, many returning in taxis from the other end of the walk. 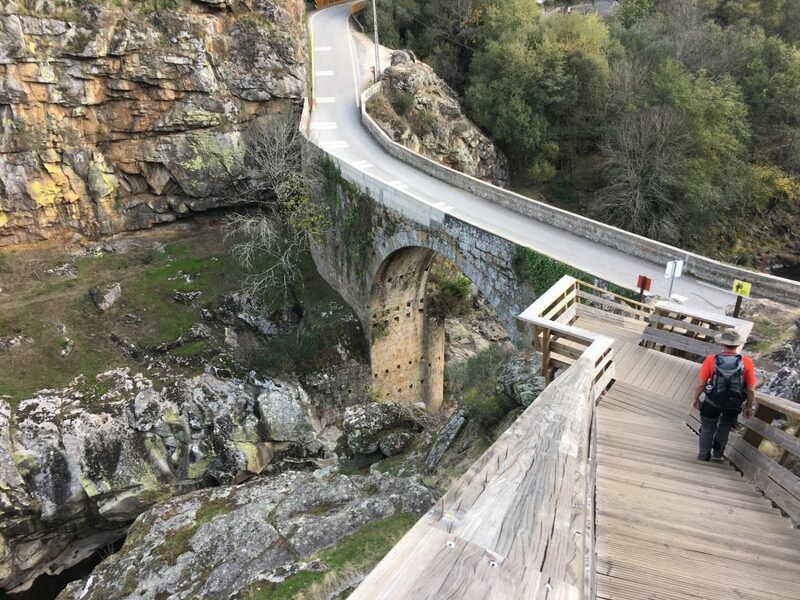 Looking down on the Areinho road bridge across the Paiva river. The next morning it was 5ºC in the van. Much warmer in the snug of our bedroom, but the coldest morning we had experienced so far and only our bladders provided motivation to get out of bed. We slowly warmed up as we prepared a lunch and flasks for our walk. From the car park it was a steady downhill to the official start of the walkway before heading across the main road and straight away tackling the hardest part of the walk – a series of staircases leading up to the top of the gorge. We wondered how people didn’t just avoid purchasing tickets as there are no barriers to stop anyone from accessing the paths, but at the top of the walkway they had cunningly placed the first ticket inspection point. There was another inspection point at the far end of the walk and also a park warden wandering about at the mid-point so you weren’t going to get away with it. The sun was shining and the initial climb up all those steps was very warm, but straight away we were going down an equal number of steps into the gorge and there the low November sun was often obscured by the cliffs, providing welcome shade with a bit too much contrast for good photos. We wound our way along the paths through a landscape that switched many times between dry rocky slopes and shaded forest that looked very British with autumn colours, ferns and mosses. Birds and butterflies flitted over the water, we saw plenty of yellow wagtails and a dipper playing in the water, easy to spot with it’s distinctive wide white bib. 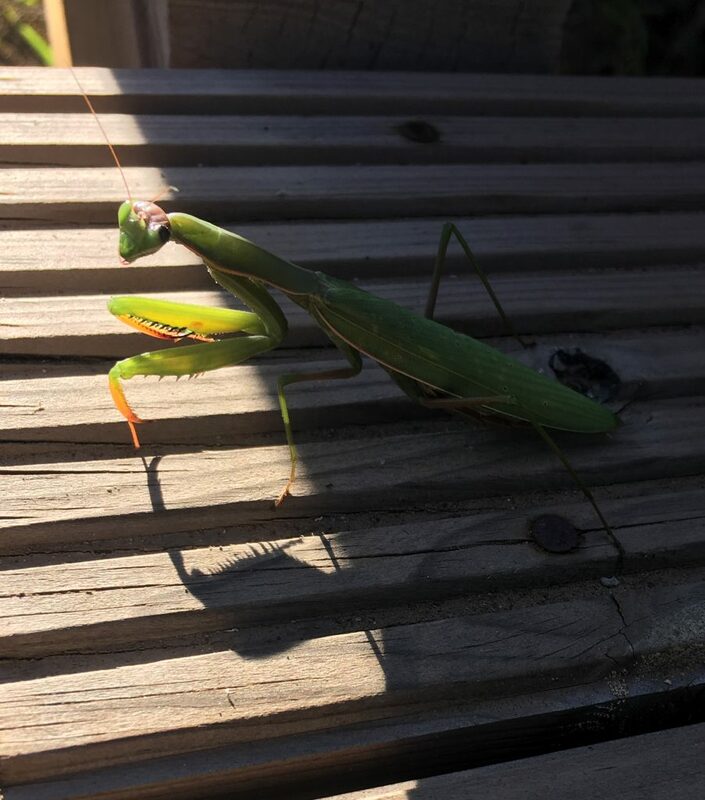 At one point we saw a European mantis sitting on a step, as cool – and as green – as a cucumber. 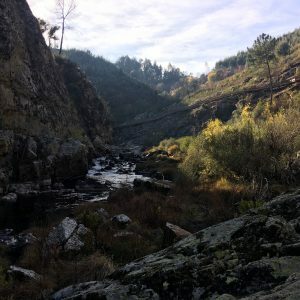 The Paiva gorge is well known for it’s white water but this year has been so dry that the river’s flow was placid and the rocks that would normally create the rapids were exposed and dry. Boards along the walk pointed out geological features which were easy to see with the river so low. 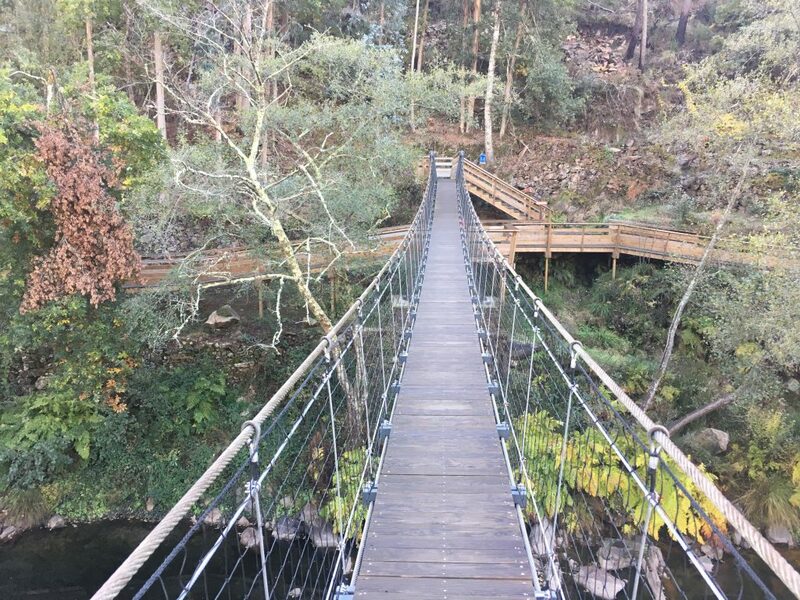 Roughly half way the walkways are crossed by a couple of other trails, here there is a suspension bridge; an opportunity to look down on the river from a bouncing and swaying vantage point (not a compulsory part of the walkway). There were also toilets half way, a welcome opportunity as leaving the path for a wee was going to be a bit tricky. Along the way Paul enjoyed pointing out the way that the walkways had been constructed, the clever bolts that were used to anchor the timbers to the rock and the bits of joinery that had been well put together to cope with odd angles. Not just any old garden decking! We got to the Espiunca end, 8km later, in just over two hours, taxis were waiting for the weary but we turned around and made our way back, taking a bit more time to stop and look around. Despite it being a Monday in November there were a good number of other people on the walkways, I can imagine that in the height of summer it could get quite frustrating and feel like a conveyor belt (I assume they limit the numbers through the ticketing system), but also you could take time to stop by the river and have a paddle or a swim; the November water was far too cold for us. In all it took us 5 hours with plenty of rest stops and photo opportunities. The trudge back up the dusty tracks to the carpark was probably the hardest part of the day. We could see why the walk had won tourism awards, it was well maintained with information boards, toilets and cafes but most importantly it was in a beautiful and interesting location. If you’re a decking fan then that would be the icing on the cake!